Each member in this image represents a different powerset within the emotional spectrum. It is said in the DC Universe (where Superman and Batman are from) that there is power that is derived from emotions. 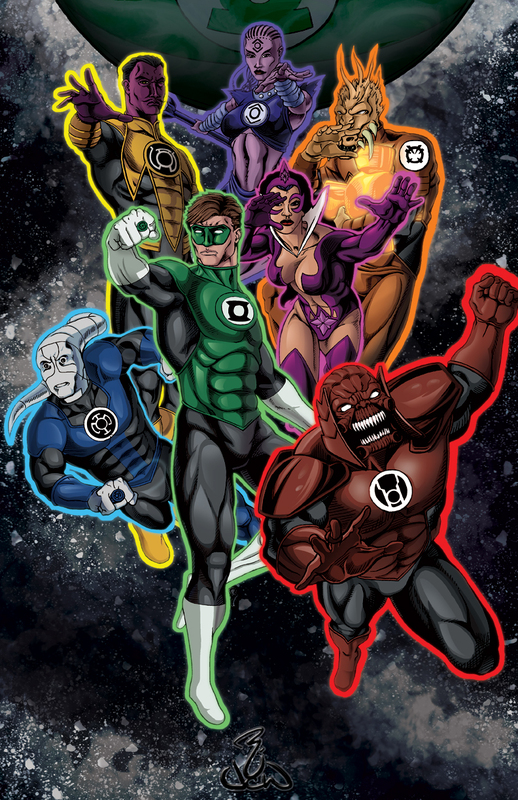 Clockwise starting from 12 o'clock, Indigo-1 (Compassion), Larfleeze (Greed), Star Sapphire (Love), Atrocitus (Rage), Hal Jordan (Willpower), Saint Walker (Hope), and Sinestro (Fear). Willpower is central because without it the other emotions aren't as potent. Hope empowers each emotion so much, especially willpower, that it can bring the power of it's partners up beyond it's threshold without damaging their emotional partner. This was one of my first group shots as an illustration, and I learned a great deal working on this.